The British actor began his film career in 1962’s Young and Willing and worked steadily throughout the 60s and early 70s in both films and television series, including a role in 1966’s Best Picture winner A Man for All Seasons. Things began to change in 1976 when he portrayed maybe the most infamous of Roman emperors, Caligula in the classic miniseries I, Claudius. Two years later he played Max in Alan Parker’s Midnight Express, winning a Golden Globe for Best Supporting Actor and earning the first of two Oscar nominations. 1978 also saw Hurt use his distinct voice to great acclaim in animated hits Watership Down and Ralph Bakshi’s Lord of the Rings, where he voiced Aragorn. This all worked up to the best two years of his career where he played doomed space explorer Kane in Alien, and in his greatest role, John Merrick in 1980’s The Elephant Man. Directed by David Lynch and produced by Mel Brooks, The Elephant Man required Hurt to undergo hours — sometimes 7-8 hours at a time — of makeup to portray Merrick, a man horribly disfigured from a genetic disease. The role earned Hurt a second Oscar nomination, his only for Best Lead Actor, and yielded one of the most memorable movie quotes: “I am not an animal!” His relationship with Brooks got him supporting roles in two of the filmmaker’s 80s comedies, History of the World Part 1 in 1981, and Spaceballs in 1987 where he spoofed his own death scene from Alien. (That, funny enough, is where I first was introduced to John Hurt.) Younger audiences will remember him as wandmaker Ollivander in the Harry Potter films, Hellboy’s adopted guardian in Hellboy, (2004) and the Hitler-esque Chancellor Sutler in V for Vendetta (2005). 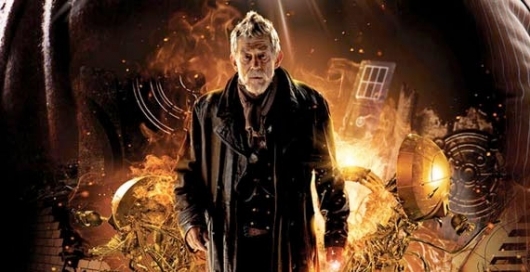 Doctor Who fans will remember him as the War Doctor in 50th anniversary special in 2013. Hurt can be seen in theaters now in the Oscar-nominated film Jackie starring Natalie Portman. His impeccable career earned him several awards and honors, chief amongst them perhaps, he was knighted by Queen Elizabeth II last year for his services to drama. Hurt leaves behind his wife Anwen Rees-Myers and two sons from a prior marriage, Nicolas and Alexander. He contracted pancreatic cancer in 2015 and died just five days after his 77th birthday. The actor who died on screen more than any has passed on.